After searching and searching for their missing dog, a Lawrence couple called a pet detective. No, it wasn’t Ace Ventura, but a woman from Oklahoma and her pack of canines. Tammy and Mick McElhinney’s dog Bubba, a Shar-Pei, went missing Oct. 21. Tammy said they had left at 11 a.m. for Topeka and left the doggy door open so Bubba and his brother, Boomer, could go in and out of the house that rainy day. When they returned, Boomer was the only one home. The McElhinneys posted signs that the dog was missing on grocery store bulletin boards and mailboxes. They received a few calls, but nothing panned out. Just as they started to lose hope of ever seeing Bubba again, Tammy said a family member told her about an article in Dog Fancy magazine. 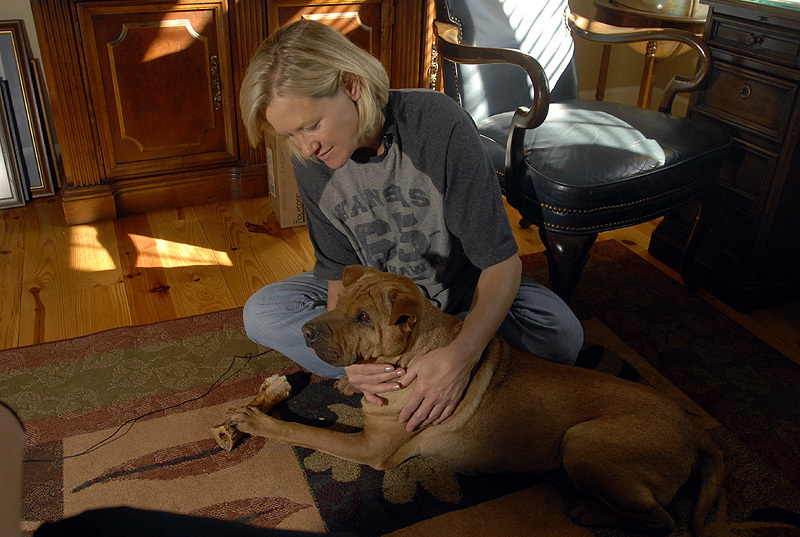 The story was about Karin Goin, owner of Pet Detectives Inc., an Oklahoma-based business. Goin said she started the company because she realized the need for a dog-and-cat sleuth after losing her own pup. “I, unfortunately, was also a missing-pet owner,” she said. Since 2004, Goin said her team of human and canine investigators have helped owners find missing pets – or at least helped owners understand what may have happened to them. Goin claims about a 97 percent success rate. She doesn’t always find pets, but her trained scent-tracking dogs and investigative techniques can at least lead owners in the right direction. And she’s been busy. The company takes jobs all over the country, Goin said, from New York to California. “I didn’t realize the huge demand,” she said. Typically, she can help owners find pets just by giving some advice over the phone. She only comes to the scene, she said, in extreme cases – when a pet has been missing for longer than seven days, the typical threshold to find them. Lawrence resident Tammy McElhinney and her Shar-Pei, Bubba, are back together again after Bubba went missing Oct. 21. Goin said Bubba fit that description. Before arriving Tuesday in Lawrence, Goin gave some instructions: First, build massive “lost dog” signs. Those little white fliers rarely cut it. Make the signs huge and pink, so everyone can see them. Then, McElhinney said she put Bubba’s harness in a Ziplock bag along with four or five gauze pads. The pads soaked up Bubba’s smell so the search dogs could get a better whiff of whom they were searching for. On Tuesday, Goin and her search dogs began looking for Bubba. The McElhinneys paid about $1,400 for the service. Tammy McElhinney said Goin and her dogs followed Bubba’s scent through the neighborhood and in the area around Sunflower School where Bubba reportedly had been seen before. Along Clinton Parkway, the dogs finally picked up a strong scent. McElhinney watched the dogs and Goin go from Wakarusa Drive to Lawrence Avenue, then toward 27th Street. Then the scent ended in the middle of the street. Whether someone picked him up or not was a mystery. But it seemed, McElhinney said, that the trail ended there. Until the phone rang that same day. Lawrence Humane Society officials called Tammy McElhinney and said that someone near 31st and Iowa streets had found a Shar-Pei that fit the description the McElhinney had left with the animal shelter earlier. Tammy McElhinney and Goin immediately went to the area and there was Bubba, hanging out with a few college students next to an apartment complex Dumpster. He was a few pounds slimmer, but safe nonetheless. Tammy McElhinney said she thought the huge pink posters may have tipped the students off – or maybe it was just having the pet detectives in town that helped. Because, McElhinney said, having Goin in town gave her something she hadn’t had in weeks: hope. “I kind of had hope, but I was losing it. It had been too long,” she said.